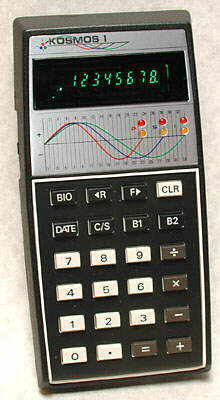 Four function calculator and Biorhythm computer. 102 x 158 x 33 mm (4.0" x 6.25" x 1.25"). Made in Japan, for Kosmos International (U.S.A), Inc., Atlanta, Georgia. Can calculate a persons present position in their three biorhythm cycles, Physical, Emotional, and Intellectual. The manual has an impressive bibliography of books and articles on the theory of biorhythms. It says "Biorhythms are defined as the different cycles your mind and body go through every day. There are three of them. A 23-day physical cycle. A 28-day emotional cycle. And a 33-day intellectual cycle. Your daily position in each of these cycles has a lot to do with how you feel"
The analysis of your Biorhythms was fashionable in the mid-1970s. 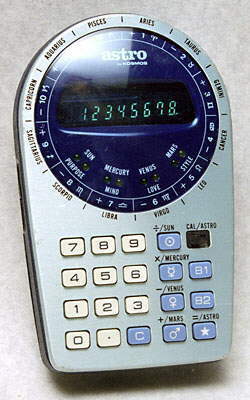 Kosmos produced several models of calculators for making the calculations in the 1970s, some also sold under the Radio Shack name. They are not uncommon so must have sold reasonably well. 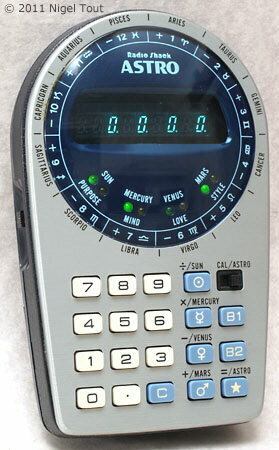 Kosmos Astro in use in calculator mode. Kosmos Astro in use in astrological mode. Distinctive features: Calculator and astrological predictions. Display is 8 digits, blue fluorescent. Four function calculator and astrological predictions. 3v (2 x AA batteries). 71 x 120 x 25 mm (2.8" x 4.75" x 1.0"). You can use this very distinctively styled model for normal calculations and also for astrological predictions. 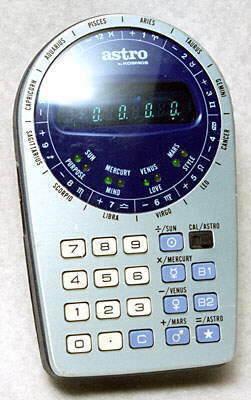 There is also a version of this calculator under the Radio Shack label, the EC-312 ASTRO.